For Seco Tools the significant results from the installation of a Wogaard Coolant Saver on the company’s Technical Centre 5-axis machining centre led to the units being installed across all of the production machine tools and the formation of an engineering partnership between the two businesses. Initially installed, using the Wogaard fitting kit, on a DMG Mori DMU 85 Monoblock 5-axis machining centre that provides Seco Tools with the ability to demonstrate its range and the high performance capability of its cutting tool solutions, as well as support specific project work undertaken for customers in the aerospace, motorsport, medical, marine, power generation and general precision engineering sectors. Aesthetically this was important to Seco; any visitor walking in to the reception area at the impressive facilities can immediately see the production area and Technical Centre through a glass wall. “It is the heartbeat of what this company is all about,” Richard Smith states. Developed and optimised specifically for use with CNC machining centres, lathes and mill-turn centres equipped with automatic chip conveyors, the Wogaard Coolant Saver consists of a stainless steel vacuum cup that is simply placed on the bottom surface of the swarf bin, and a venturi-unit that branches off the pipe supplying coolant or cutting fluid to the CNC machine tools spindle or coolant nozzles. The venturi-unit uses a constriction in a bore which is designed to cause a pressure drop when a liquid or gas flows through it, generating the vacuum required. Developed specifically for this single purpose the inside geometry of the venturi and nozzle is optimised for cutting fluid which often contains small particles from machining operations. A polyurethane hose mounted to the bottom of the venturi-unit returns the collected liquid back to the CNC machine’s main coolant reservoir. With so few elements and no moving parts the Wogaard Coolant Saver is easy to install and is virtually maintenance free. 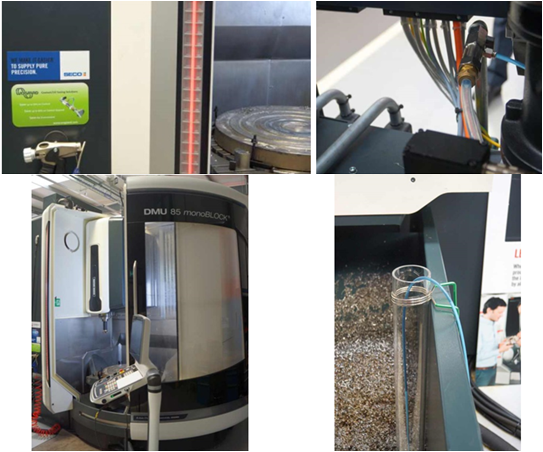 The positive results achieved on the Technical Centre machine tool prompted the production staff at Seco to install the Coolant Saver on the rest of the Hermle multi axis machining centres used to manufacture customer specific bespoke cutting tool solutions. The technical partnership provides a synergy between Seco Tools and Wogaard, allowing both companies to highlight the benefits of each other’s products to visitors attending the Technical Centre. Richard Smith concludes: “Like every production manager in the UK I have to focus on the key issues in the machine shop. Having the Wogaard Coolant Saver in place deals with some of these issues and allows me to focus in the more depth on key performance parameters for the business.